No. 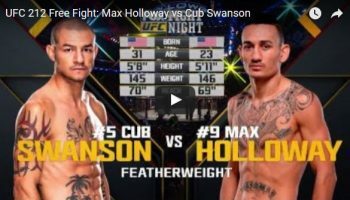 4 featherweight Cub Swanson clashes with No. 6 Brian Ortega, who hopes to keep his perfect record intact in the main event of UFC FIGHT NIGHT®: SWANSON vs ORTEGA. The always-entertaining Swanson is back in action for a California showdown against fast rising Ortega, a jiu-jitsu black belt who will be headlining his first UFC event. The action goes down Saturday, Dec. 9 at Save Mart Center in Fresno, Calif. and will air live on FS1. Swanson (25-7, fighting out of Palm Springs, Calif.) will compete in his second consecutive main event in search of a fifth victory in a row. Swanson has won 10 of his last 12 contests, and earned Fight of the Year honors for his UFC 206 victory over Dooho Choi. A win could put Swanson in position for a shot at the 145-pound title, but it will not come easy against the undefeated Ortega (12-0, fighting out of Torrance, Calif.). The Los Angeles native is on pace to be the UFC’s next big star and is in search of the biggest win of his young career. Coming off incredible performances against Renato Moicano and fan favorite Clay Guida, “T-City” knows a strong performance in front of home state fans will catapult him into title contention in the talent-rich 145-pound division. Two bantamweight bouts are also expected to keep fans on the edge of their seats. Sixth-ranked bantamweight Bryan Caraway (21-7, fighting out of Las Vegas, Nev.) has an impressive 6-2 record inside the Octagon, and he is currently riding a two-fight win streak. The Ultimate Fighter® season 14 competitor will compete for the first time in more than a year against up-and-coming Luke Sanders (11-1, fighting out of Nashville, Tenn.). “Cool Hand” started his professional MMA career on a tear, scoring nearly half of his wins via knockout. Fans can expect both fighters to keep moving forward in what should be a thrilling contest. Always entertaining, No. 7 Aljamain Sterling (14-2, fighting out of Uniondale, N.Y.) is hoping a win this December will earn him a top-five ranking in the competitive bantamweight division. Sterling’s path to the top of the weight class goes through veteran submission specialist Rani Yahya (24-9, 1 NC, fighting out of Brasilia, Brazil). The four-time Submission of the Night earner is known as one of the best ground fighters in UFC, as an astonishing 18 of his 24 career victories have come via submission. Hometown fans will cheer on one of their own when flyweight Alex Perez (18-4, fighting out of Lemoore, Calif.) makes his UFC debut. Perez looks to earn his sixth consecutive win and eighth first-round finish while defending his home turf against the Philippines’ Carls John De Tomas (8-1, fighting out of Quezon City, NCR, Philippines). The 21-year old “Golden Boy” hopes to use his Muay Thai background to ruin Perez’s homecoming. Two veteran women’s bantamweights will compete for the first time in the UFC at flyweight when Brazilian jiu-jitsu black belt Alexis Davis (18-7, fighting out of San Jose, Calif.) faces-off against the first woman to ever step inside the Octagon, Liz Carmouche (10-5, fighting out of San Diego, Calif.). Undefeated former Alabama Crimson Tide national football champion Eryk Anders (9-0, fighting out of Birmingham, Ala.) collides with veteran John Phillips(21-6, fighting out of Swansea, Wales) in a middleweight duel. Tennessee native Scott Holtzman (10-2, fighting out of Knoxville, Tenn.) meets the dangerous Darrell Horcher (13-2, fighting out of Shermansdale, Pa.).